Our Quadrupel features notes of stone fruit from a Belgian abbey yeast strain and the taste of sweet toffee from a touch of Belgian Candi syrup. This mahogany-colored ale is fermented with a distinct Belgian abbey ale strain, then bottle conditioned with extra sugar and yeast for at least two weeks. European hops add balance to the sweetness of the malt and yeast. In the United States, the term “Quadrupel” refers to a very strong, dark ale with a spicy, fruit flavor and high alcohol content. 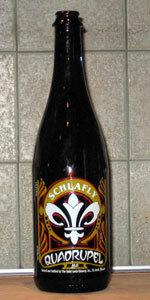 The beer style is intended to be stronger than a Belgian-style Tripel, so the alcohol content tends to be 10% or more. Beyond these guidelines, there is still discussion among brewers as to what constitutes a Quadrupel. Poured from 750 ml bottle into snifter. S: Some slight yeast esters, but nose is dominated by plum, date, and Belgian candy sugar. T: Lots of sweetness up front especially when cold. Plum, raisin, date, and fig. Some spices coming through as it warms including pepper and clove. M: Full bodied and nicely carbonated coating the tongue nicely. Tends a bit towards the sweet side when cold, but improves as it warms. O: A very solid quad. Glad I grabbed another bottle to take home.